We in North America tend to forget that Russia is Europe's second biggest economy. It's also the world's biggest producer of oil and gas -- probably more than the rest of the world combined. What Russia has that we haven't to the same extent, is Islamic terrorism. On a recent 1,800 km cruise down Russian rivers and lakes to Moscow, visiting churches and historic sights (sponsored by various university alumnae), the most persuasive of several distinguished lecturers on things Russian was Larry Black, a Carleton University professor and founding director of the Centre for Research on Canadians-Russian Relations. Appealing about Prof. Black was his realization that "experts" on Russia's (and before that, the Soviet Union's) politics and future were often calamitously wrong. Black is cautious, informal, immensely knowledgeable and acutely aware that until something actually happens in Russia, it's best not to make categorical assumptions. Those with memories might recollect that until the Soviet Union imploded and crashed, "experts" thought it was invulnerable. Before that, on the eve of Khrushchev's ouster in 1964, experts were proclaiming that "his mantle of power was never more secure..."
In Russia, parliamentary elections are due on Dec. 4, with the presidential election in March. There is even a move in Russia to make it a parliamentary democracy, which may be the future, but not quite now. The big news in Russia, for those who care, is that Vladimir Putin is again running for president -- a role he's held twice before, until the constitution declared twice was enough. He then switched to prime minister for a term, and is now eligible for two more terms as president, with each term extended to six years. That means Putin is likely to be in the job until 2024. The present president, Dmitry Medvedev, (who has a more distinguished administrative record than Putin) is likely to be the PM. The pair have a sort of Tweedledum and Tweedledee relationship that works well. It's hard to see Putin losing in the election -- 315 of 450 seats in the Duma are held by the conservative United Russia party which supports Putin and Medvedev. Although the popularity of United Russia has dropped from 64 per cent in 2007 to 40 per cent last May, there's no other party that is likely to govern. Oddly, as described by Black, the president of Russia belongs to no party -- but United Russia is (or has been) his. As something of a macho, dynamic individual, the great achievement of Putin after the collapse of the Soviet Union in 1991, was to restore the rule of law amid the economic and political chaos that afflicted liberated Russia. 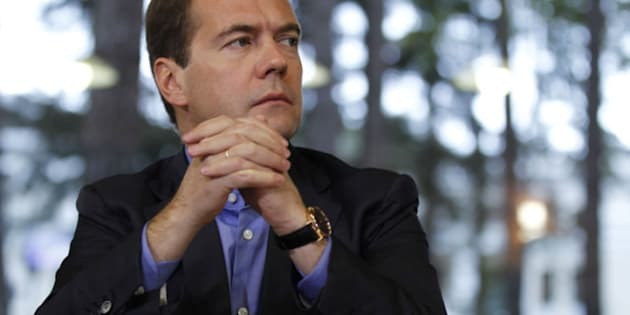 One never knows, but it's unlikely Medvedev will challenge Putin's bid for the presidency. And Dmitry Rogozin, leader of Russia's extremist nationalist party, Rodina, seems on the verge of throwing in with United Russia to ensure Putin's return to power -- with possibly himself destined to be deputy speaker. We in North America tend to forget (if we ever know) that Russia is Europe's second biggest economy. It's also the world's biggest producer of oil and gas -- probably more than the rest of the world combined. China now buys all its gas from Russia. It has more hydro power than the rest of the world combined, has the largest land space and 25 per cent of the world's unfrozen water. Russia has 31 nuclear reactors and a severe labour shortage. Its potential is limitless. What Russia has that we haven't to the same extent, is Islamic terrorism. We hear little about Russia's continuing war against terror -- maybe a thousand terror incidents a year, most of them by Chechen extremists. Our media tends to the view that Russia (and before that the USSR) is oppressive and at fault in Chechnya. What isn't widely realized that after the first Chechnya war (1992-96), Russia agreed to a treaty and to study the question of separation. Russian people didn't give a damn. Chechnya was at the bottom of then country, and who cared? Something could be worked out. Chechnya won. The second Chechnya war was started in 1999 by an Islamic terrorist called Shamil Basayev -- a homicidal jihadist who was against the existing Chechnya government and wanted Sharia law imposed, favoured foreigners being killed and, indeed, has hoisted heads impaled on pikes. Shamil was responsible for the 2002 Moscow theatre hostage incident that resulted in 170 deaths; he engineered the Beslan school massacre in 2004 of 380 people -- 190 of them children; his people were behind the suicide bombing of a hospital that killed 33. Basayev was apparently killed in an explosion, but another terrorist, Doku Umarov is carrying on the terror program -- killing 46 in a Moscow metro bombing last year, and 36 killed earlier this year when Chechen jihadists shot up Domodedova airport. (Security at that airport is still nervous and intense -- three sets of electronic scannings for passengers). Today most Russians would gladly see all Chechens killed. The first Chechnya war was nationalistic, the second was Islamist, involving Saudis. Russia's war against Islamic terrorism begs the question why it seems to side with Iran against U.S. interests, and opposed the air war against Libya's Muammar Gadhafi. Why is Russia sympathetic towards Hamas and Hezbollah? Who knows? Maybe it's another example of Churchill's observation that Russia is "a riddle wrapped in a mystery inside an enigma... perhaps the key is Russian national interest." Perhaps indeed -- one the Larry Black and others constantly probe.